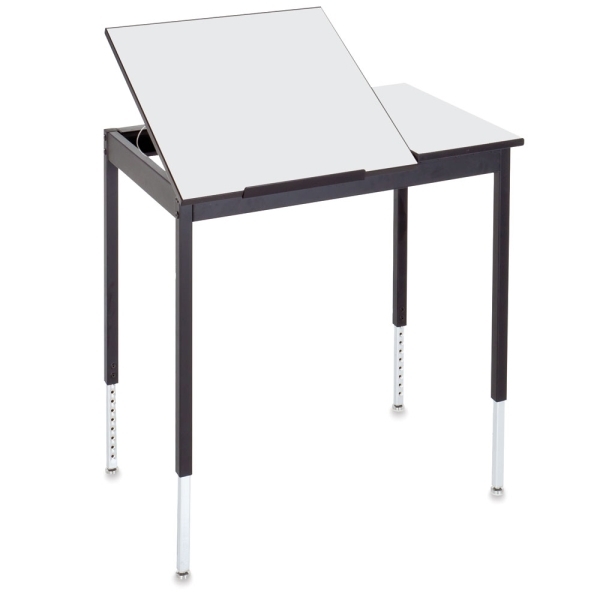 The sturdy Smith System Planner Graphic Arts Table adjusts to suit your work needs. Its height can be positioned at 30" (76 cm) for sitting or 37" (94 cm) for stool use. Legs adjust on 1" centers from 30" to 38" (76 cm to 96.5 cm). The tabletop slope adjusts from 0° to 45° in fixed positions. Built to last, the table has a heavy-duty welded steel frame for maximum strength and stability. Its melamine work surface is fused to a 0.6" (16 mm) thick, 62 lb density board. The Graphic Arts Table has a gray top and a black edge and frame. It's available with a one-piece or a split top. The split-top model has a flat surface on the right side and a 24" × 24" adjustable surface on the left. For measurement details, please see the Item Specs tab.